“Tech is the new oil,” the head of a well-known venture capital fund said recently. But while the scale and pervasive nature of the technology industry’s products might match that of oil, innovation is hardly a commodity. New ideas emerge every day, and most don’t make it, either because they aren’t good enough or the team behind them can’t execute. Glance Technologies Inc. (CSE:GET) doesn’t look like it will have to contend with either of those problems, as its unique mobile payment technology addresses an issue many people face each day and early data suggest the team is doing a good job getting the product into the hands of its target user base. Three-quarters of diners in North America use some form of plastic to pay for their meals, but waiting for your server to bring the bill, followed by another stretch before for the card machine arrives, too often means that a good meal is followed by a frustrating delay before you can get on with your day. The solution to this problem is Glance Pay, an app that Glance debuted the same day it listed on the Canadian Securities Exchange this past September. The app’s premise is simple: allow diners to pay for meals using their smartphones, thereby slashing the time needed to deal with the bill. Looked at another way, Glance seeks to revolutionise how we pay for meals. “Even when the wait staff are doing everything they can, when everybody is in a rush or all wanting to leave during a peak time it can sometimes take up to 20 minutes to pay your bill,” says Penny Green, Glance’s co-founder, president and chief operating officer. With GlancePay, users take a photo of the cheque, confirm the amount and hit the pay button. There are also options to add a tip, split the bill and even store the receipt – a very useful tool if you’re on a business lunch. And increasing efficiency and customer satisfaction is probably not a bad idea in an industry which in North America will turn over US$750 billion this year. Green – who is listed in Canada’s W100 top 100 entrepreneurs – founded the company alongside Desmond Griffin, the driving force behind mobile parking payments business PayByPhone before he sold it for around C$45 million over five years ago. “I wouldn’t want to build a payment app unless I had Desmond leading the team,” explains Green. The experience of the two co-founders – who still own more than 50% of the company – has allowed the business to thrive and develop the alliances needed by any successful start-up, Green adds. 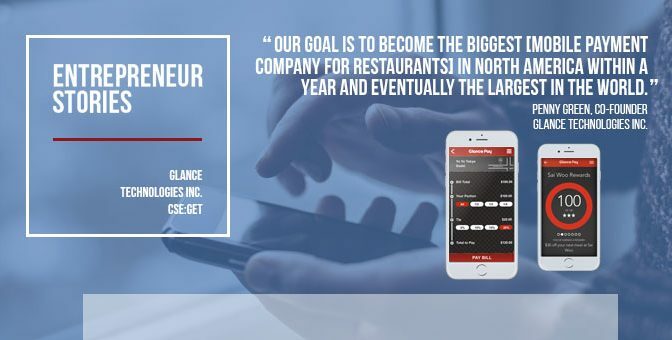 On November 23, Glance Pay announced it had signed up the MR MIKES Steakhouse Casual chain of 32 restaurants in Western Canada, bringing the total number of restaurants signed by Glance to 95. Glance has been aggressively signing up restaurants, and announced it signed 48 new restaurants to use the Glance Pay app within a recent 36 day period. Green is more than happy with the progress made by Glance and its app so far on its quest to become number one, and is confident it can be profitable within the next few years. “We are far exceeding our projections already in terms of adoption rates and usage. Our breakeven point can be after one year of operations, depending on how fast we expand,” explains Green. As you might imagine, there are a few companies in this space that are trying to provide other solutions, but Glance isn’t too concerned by what they offer. The main stumbling block for competitors is that they normally require their software to be integrated into a restaurant’s point of sales system, which can be time consuming and expensive, and can also limit the number of potential customers able to come on board. Glance also allows each restaurant to offer a customized rewards scheme for its customers through the app, so that regular customers can receive as much as 12% of what they spend back in credits at the restaurant, redeemed seamlessly as rewards through the app. All 40 of the venues currently up-and-running on the app are in the Vancouver area, but within the next 12 months Glance is hoping to tackle the mobile payments space in other parts of Canada and the US. It already has restaurants signed in British Columbia, Alberta, Saskatchewan and Manitoba and plans to launch in Toronto by spring 2017. Although the company is looking to move into new areas geographically, with over 3,500 restaurants in Vancouver alone, Green doesn’t expect a move into other sectors such as retail any time soon. As with every business it’s all about the money, and Green explains that the company recently engaged Echelon Wealth Partners Inc. as agent to undertake a brokered private placement. Glance also completed an Initial Public Offering through Leede Jones Gable Inc., raising C$1 million in September. GlancePay processed some C$56,000 of transactions in the second week of November and use has been growing at an exceptional rate since launch. To give investors some sort of benchmark, Glance estimates that each new restaurant it signs up – it’s averaging five a week at the moment – brings with it the potential to process another C$1 million of transactions each year. Even though the app will only take a small, “competitive” cut of those revenues, the potential is obvious. But Glance isn’t just relying on transactions across its platform. The team realizes that once you have the audience, offering other features such as advertising and special promotions through the app to clients ups overall profit potential. This story was originally published at www.proactiveinvestors.com on Nov 28, 2016 and featured in The CSE Quarterly. Learn more about Glance Technologies Inc. at http://www.glancepay.com/ and on the CSE website at http://thecse.com/en/listings/technology/glance-technologies-inc.